In July 2018, I travelled to México City to start with the archival work of my doctoral project. My research aims to understand the changes in the Lake Pátzcuaro landscape during the mid-twentieth century (1920-1950) from a historical and cultural geography perspective. To do so I study Lake Pátzcuaro’s mural paintings, social science research, identities formation, and lake monitoring and environmental protection. The Lake Pátzcuaro lies in Central West México in the state of Michoacán, located on the Trans Mexican Volcanic Belt. Besides the lake, the largest town in the area, located in the southeast of the lake, is also called after the lake. The municipality to which it belongs together with three other municipalities shapes the Lake Pátzcuaro region. Figure 1. 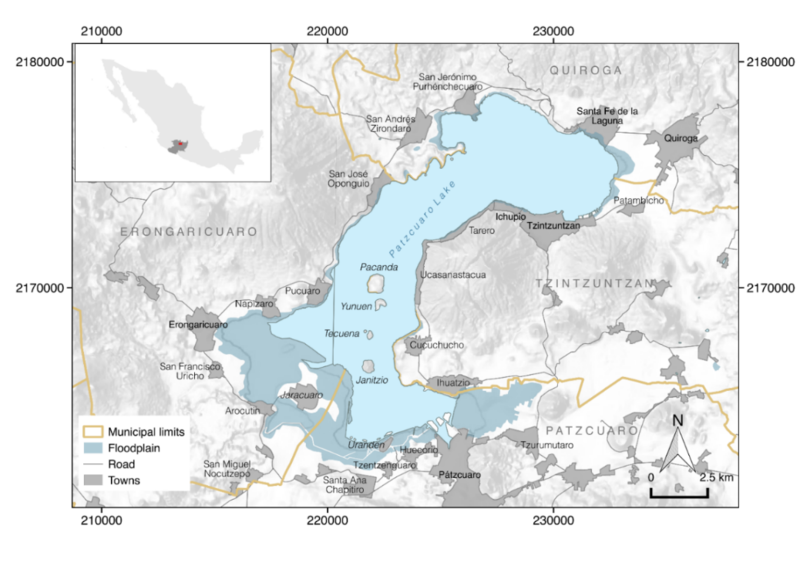 Lake Patzcuaro location. Map by the author. In September, I went to Michoacán to continue my work in the archives of Morelia and Pátzcuaro. At the end of my stay, I had the pleasure to assist on a field trip to the Patzcuaro region organised by Geohistory and Environmental Sciences undergraduate courses; both taught at National Autonomous University of Mexico in Morelia. I was teaching there before starting my PhD at the University of Nottingham. For this reason and because my research is about Patzcuaro, the professors in charge of the practice invited me to accompany them. The objective of the field trip was to analyse the historical transformation of the Lake Pátzcuaro landscape. Arriving in Patzcuaro, we moved to a viewpoint located on the hill of El Estribo, which is also an extinct volcano. The place also has a pavilion and picnic tables. From the viewpoint of El Estribo, you can see the southern part of the lake. The sky covered with clouds gave to the landscape a dramatic aspect. Our gaze wandered from the calm waters of the lake and its islands to the surrounding mountains. (See the main image Figure 2 of Lake Patzcuaro from Estribo viewpoint. Photograph by the author). 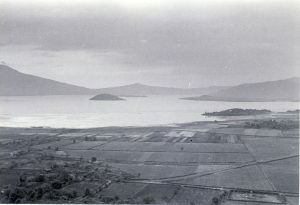 Among the materials that the students brought with them, to analyse the changes in the landscape was a picture of Lake Patzcuaro taken in 1943 by the American geographer Robert West. The photo shows the lake from the same viewpoint. At that moment, we were looking at it from the same perspective. With this, I refer not only to its visual aspect but also to a way of seeing; and that is because seeing is also a cultural, influenced by what we know or believe. Figure 3. Lake Patzcuaro looking northward by Robert West, 1943. One of the teachers asked me to tell the students more about the photo. I tell them that this appears in the monograph “Cultural Geography of the Modern Tarascan Area”, produced as part of the social science research project carried out by some geographers of the so-called Berkeley School in collaboration with Mexican anthropologists. 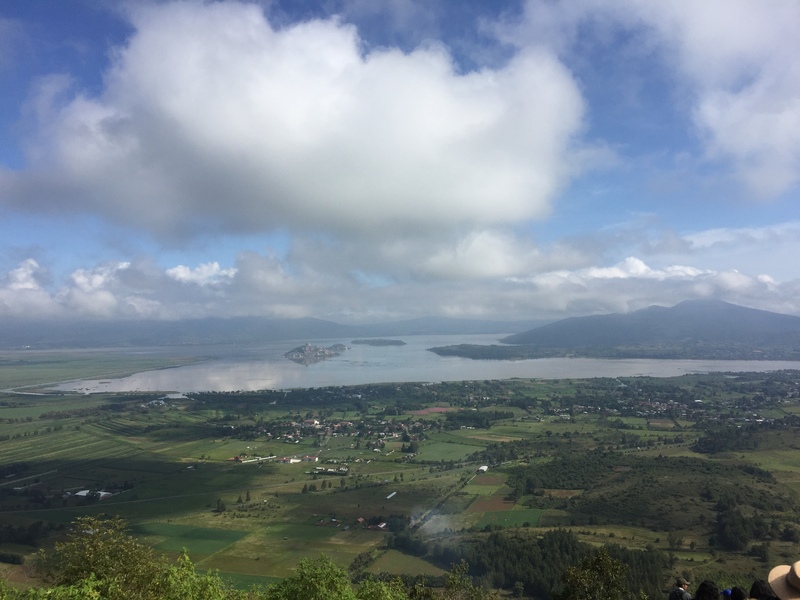 The photo of Lake Patzcuaro beyond being a visual representation tells us about a way of relating to the lake, as a place of academic study. During those years limnological studies were also developed, this was closely related to the implementation of environmental protection programs. 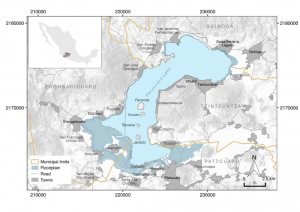 In 1936, Lake Patzcuaro basin was declared a protected area, and in 1938, the first limnological station in the country was established in Patzcuaro. The protected areas created at that time had as purpose the conservation of natural resources, the promotion of tourism and the development of scientific research. 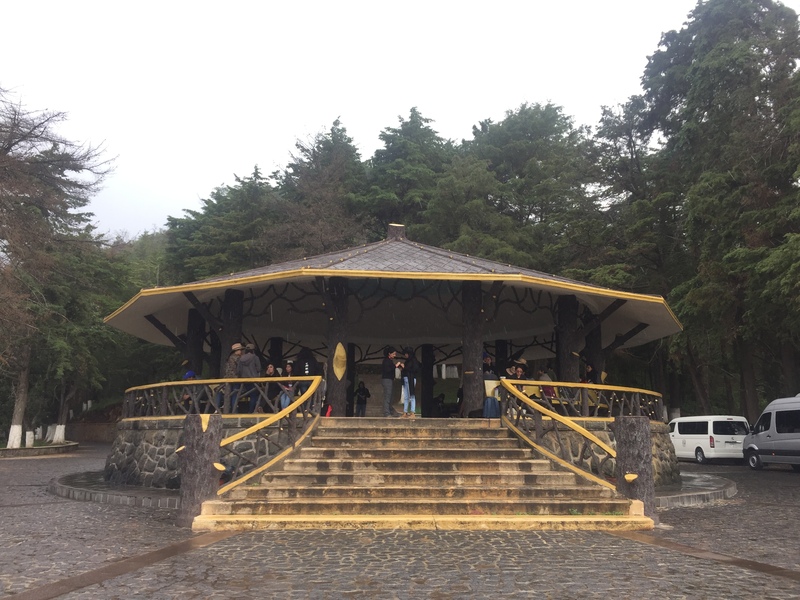 El Estribo viewpoint was created in August 1936 as part of the tourist facilities. 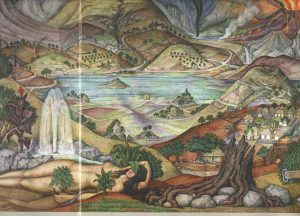 A painting by Juan O’Gorman gaves me the opportunity to tell them about another aspect of my research, Lake Patzcuaro murals. The mural represents the social and economic changes experienced in the country during the twentieth century. 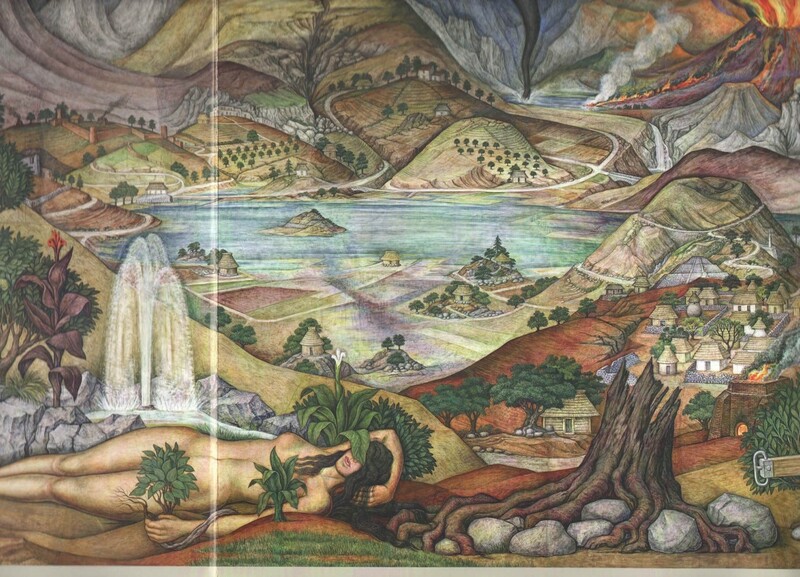 The starting point of the mural is Lake Pátzcuaro depicted as an idyllic rural landscape. If we had gone to the town, we would have seen another mural by the same painter with a similar representation of the lake. This mural is on a public library, and it tells the story of Michoacan from pre-Hispanic times to independence. Lake Patzcuaro is shown here as an indigenous landscape. Figure 5. Fragment of the mural “El credito transforma a México” by Juan O’Gorman, 1964. This exemplifies how the analysis of objects, events or daily practices can tell us a lot about the formation of the landscape. Hence, paintings, photographs and scientific or literary texts can be of great interest to a cultural geographer. They help us understand the cultural production of the landscape, telling us about our changing ways of relating to certain places and our ideas around them. From this perspective, studying the landscape of Lake Pátzcuaro involves examining the cultural processes that shaped this place and how people relate to it. The field trip ends with a walk in the crater of El Estribo, just visible because an agricultural crop covers it. On our way back to Morelia, I think about the archival work that I still have to do and when the next opportunity to share my research on Patzcuaro will be presented. Now that I have shared my research and experience of this field trip with the readers of this blog, I know the time has come again.